It seems that the first thing I say in most of these blog posts is usually something to do with the weather. Being a beekeeper makes you very focused on it. Everything revolves around it when it comes to bees. And this year has been a year of extremes. 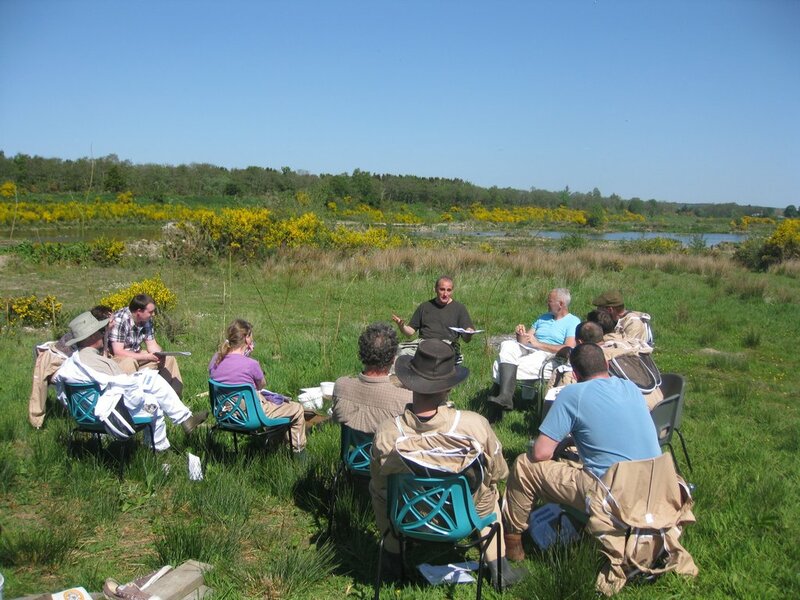 From the blast of winter we had at the apiary back in April to the extreme heat we had on Saturday 26th May when we welcomed a group of newcomers to one of our Introduction to Beekeeping courses. 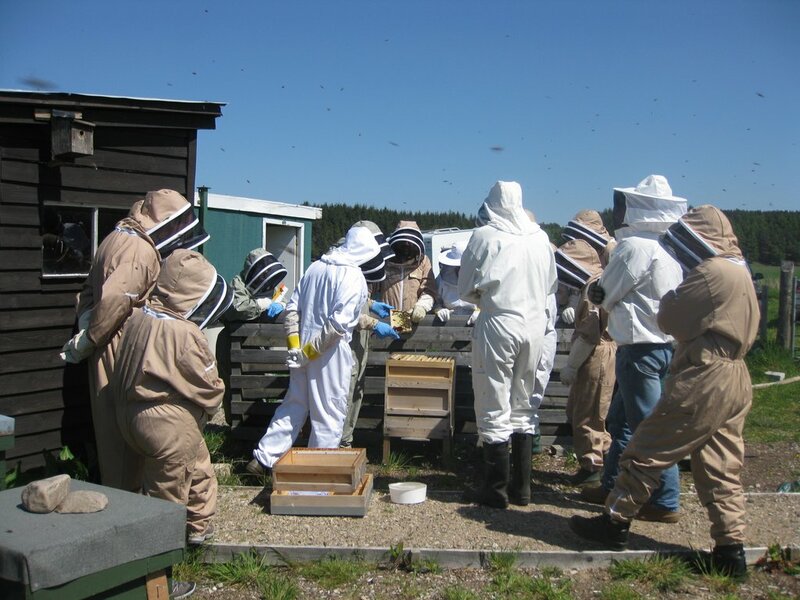 The first thing that happened when we arrived was a swarm issued from one of the hives and set off into the neighbouring whins. Everyone dived into their suits and off we went in pursuit. I forgot the camera in the excitement so no pictures I’m afraid. 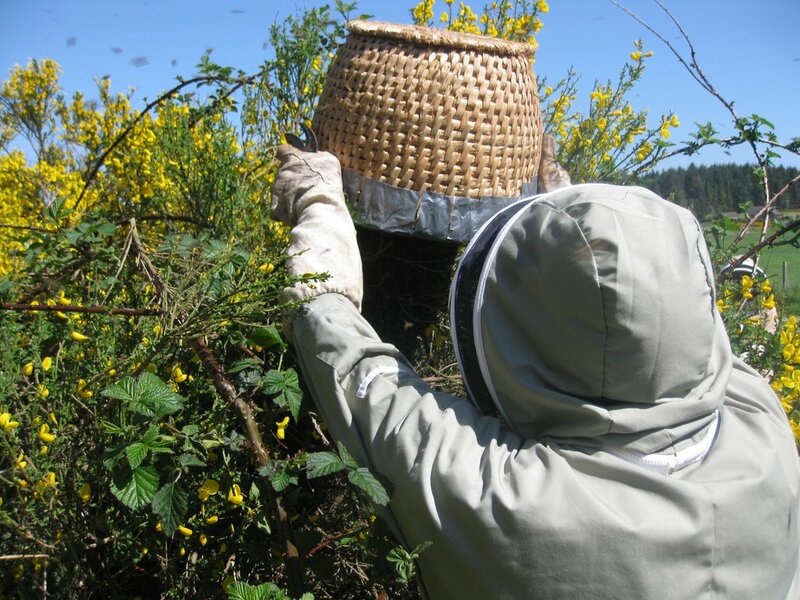 We found the cluster in short order a few yards from the apiary and with a skep placed over them and a little smoke for encouragement they headed upwards into its dark interior. The next step was to move the skep on to the ground on top of a white cloth and we left them alone to allow the rest of the bees to catch the scent from their fanning sisters. Back at the apiary it was so hot (about 27C) that we decided to move the classroom session outside. Everyone was given a quick but thorough grounding in all things bees and beekeeping which took us up to lunch time. At which point another swarm decided to issue from another hive! 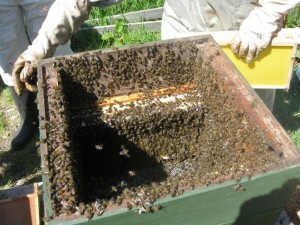 We left that to find a spot to make its cluster and went back to deal with the original swarm. Luckily the bees had taken up residence in the skep and so were collected and moved back to the apiary where a new hive had been set up to receive them. In they went and all was well with them. The second swarm had likewise clustered not too far away if in not as convenient a spot. The same technique was applied to this swarm but using my own bodged sawn-off wash basket skep instead of a posh shop-bought one! At last we were able to head off for a bite to eat and something cold to drink. 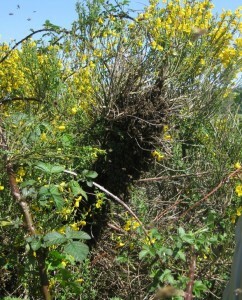 When we returned to collect the swarm it was clear that something different had occurred with this one. For one thing the skep felt awfully light. And this was borne out when the skep was emptied into a hive. 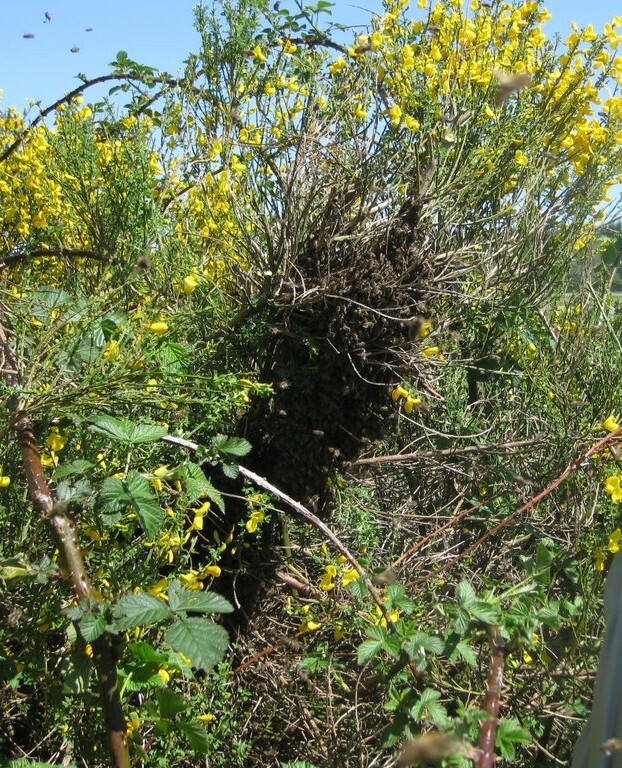 The answer was that the hive that swarmed had a clipped queen and all the bees had flown home to it once they realised she hadn’t come with them. Never mind, it was still a great beekeeping example to be able to show the beginners. Onwards to the afternoon session which was spent going through the hives and giving everyone a good look at what goes on inside. I’m sure everyone felt the heat to some extent during the afternoon and a few had to take a break in the shade of the portacabin. 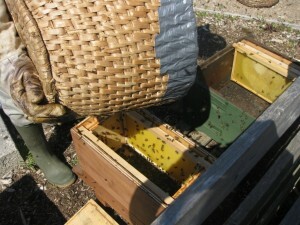 So quite an eventful day for all concerned and we got to show some of the more unusual aspects of beekeeping. 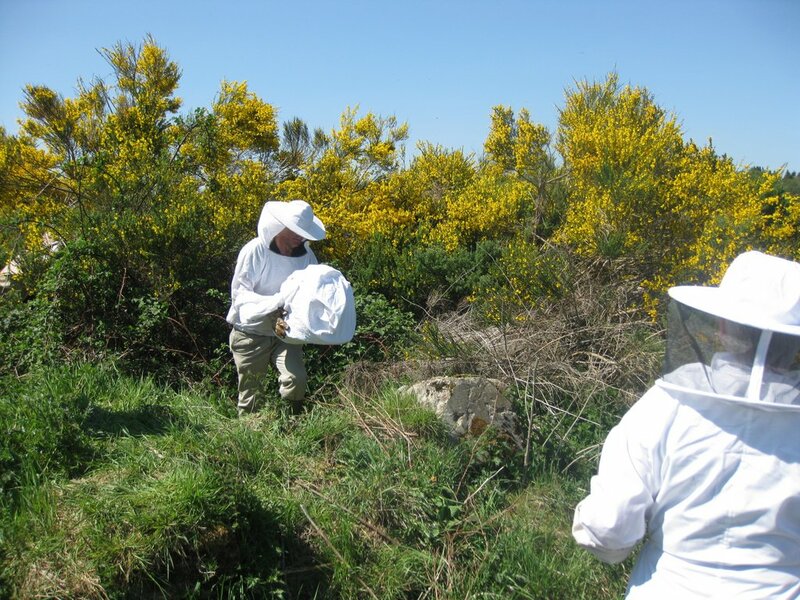 Hi Guys, It was a pretty exciting day for the beginners but I just wanted to say that swarms issuing from hives, especially in the Association Training apiary is not the usual situation and also not what we want. It was useful to demonstrate how to catch and hive a swarm but if we get our swarm control techniques right, we would hopefully prevent swarms and the nuisance they can cause to members of the public. Our apiary is in the middle of nowhere so that isn’t an issue. Because of the very cold weather in April we had not been able to do full first inspections in the hives and some of the queens were not clipped. All we were able to do was to add supers so the bees had more space and make sure they didn’t go hungry. Then, the 10 day heatwave at the end of May resulted in the bees swarming out of hives all across Moray, sometimes without there beinga queen cell started in the hive. It was the busiest 10 day period I have known for swarms since I started keeping bees 6 years ago. So the upshot is, it is not the expected course of affairs that your bees will swarm if you carry out regular inspections, and take appropriate swarm control procedures. We were able to inspect all 9 hives at Birnie the day following these 2 swarms and there were only 2 hives with queens in them. The others had swarmed, leaving behind queen cells, and if the queen had been clipped the bees had returned to the hive.